Sometimes we cat lovers just have to "get down dirty" when the subject of cleaning up messes arises, namely the pee, poop, and barf accidents that occasionally plague a house with cats. We'll address these separately, as they each require a bit different treatment. 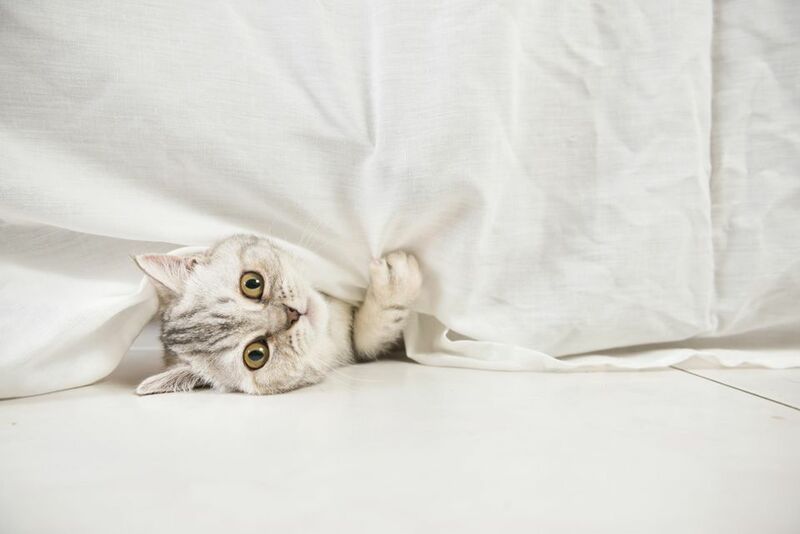 Cat owners should always look for the causes of inappropriate elimination first to eliminate urinary tract disorders and to effectively eliminate the problem. The most important thing to remember about cat urine is "get it while it's fresh." Urine goes through a decaying process as it "ages" in your carpet, caused by bacteria feeding on the organic wastes, and at the same time, converting it to gasses, primarily that strong ammonia smell. Aside from the developing odor, the longer you allow urine to remain, the more likely its chances of seeping through the carpet into the pad and/or the wood floor beneath. Blot: Use an old, thick, bath towel and blot up as much liquid as you can with it. Continue with paper towels until no moisture is seen. Dilute and Blot Again: Heavily spray the area with clear water or a mild solution of white vinegar and water, then blot again, as above. Neutralize: If the odor still exists after the carpet is completely dry, it's time to break out the big guns: urine odor removers, based on chemicals, enzymes or bacteria/enzymes, all designed to neutralize the odor by eating the bacteria causing it. In the case of dried urine, the bacterial process is well underway, and you'll need the help of the odor removal products. Follow the manufacturer's directions for best results. Be aware that if the urine soaked all the way through to the wood floor underlying, you may need to remove the carpet and padding, and treat the wood directly. You'll have to make the decision whether to attempt to save your existing carpet or re-carpet entirely. If you are surrounded by the scent of cat urine but can't find any stains, consider investing in a black light, which will illuminate the cat pee, as if by magic. They are readily available in the larger pet stores, as well as online. If it's firm, you're in luck. Pick up with a paper towel, and then, using a small stiff-bristled brush, clean the area with a mild detergent and water mixture. Follow with steps 1 and 2 above. If your cat has diarrhea, bacteria is present. Clean up as much as you can with paper towels, then clean with detergent and water. Rinse and blot, then follow with a neutralizing product, such as one of the enzymatic cleaners mentioned previously. Treat vomit stains in the carpet as you would treat feces with diarrhea. If your cat eats canned food containing red dyes, you will probably have to call in a professional, as these dyes are extremely difficult to remove. Cat owners should try not to take their cats' "accidents" personally, as they are truly accidents, and not done to be stubborn, to punish the owner, nor for any of the other human-type reasons people often assume. Cats are fastidious creatures and will use their litter boxes faithfully if everything else is right in their world. When they suddenly start making mistakes, it's up to us humans to investigate and correct the cause.